In our commitment to help you in your search for products that bring out your real beauty, we reviewed 5 of the best concealers that have age-defying properties. These products were then assessed based on their usability, longevity, and affordability until we chose what we feel is the best concealer for fine lines and wrinkles. Maybelline’s Instant Age Rewind Eraser Dark Circles Treatment Concealer is the ultimate tool for a refreshed and radiant under-eye area. No beauty junkie should be left without this item. Choose the timeBalm Concealer by theBalm if you are in need of an anti-wrinkle concealer. It is packed with skin-friendly ingredients to help keep you looking radiant at any time of the day. The Visible Lift Serum Absolute Concealer by L’Oreal contains SPF and is ideal for any skin type. It promises to address the 5 signs of aging in just 4 weeks of continued use. 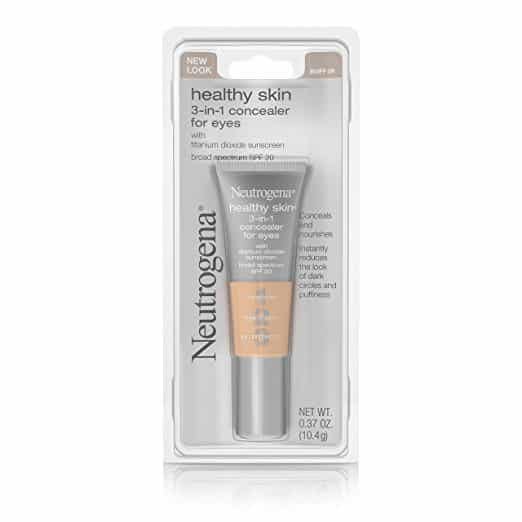 Neutrogena’s 3-in-1 Concealer For Eyes Broad Spectrum SPF 20 boasts of its formula that helps condition the skin. It comes in 4 shades and is safe for wearers of contact lenses. Lastly, the Line Smoothing Concealer by Clinique is infused with skin-brightening particles that fight shadows and evens out the skin tone. It has medium coverage and great for all skin types. Infused with Haloxyl and goji berry, this best concealer for fine lines and wrinkles takes care of all our under-eye problems instantly. Its unique packaging ensures a more targeted application. Haloxyl fades the appearance of dark circles, while goji berry promotes skin health. Packaging-wise, it comes in a cylindrical bottle with a sponge at the end which allows you to easily swipe without the need of touching it. Used correctly, it can give you an airbrushed finish. The sponge is a small piece of cotton-like material that you can saturate by twisting the collar of the applicator. We really find this interesting especially for touch-ups on the go. Lightweight, it is ideal for everyday use and is travel friendly as well. This product also has long staying power and with the right powder, can last for up to 10 hours without fading. Aside from smoothing wrinkles out, this best anti wrinkle concealer even protects the skin from environmental stressors. It provides full coverage to conceal under-eye issues like dark circles. With Panthenol and Vitamins A, C, and E, this concealer guarantees a flawless-looking you at any time of the day. It comes in 9 shades so there’s a match for you no matter your skin tone. This concealer comes in a clear pot with a clear lid and a sponge applicator inside. Lightweight, it has a peach color to it with a yellow undertone which is perfect for lightening dark circles. One of its kind, this product has a slightly hard texture making it difficult blend out. But that’s where the sponge applicator comes in—it can give an airbrushed look with the right technique. Highly-pigmented, a little of this product goes a long way since you only need so much to cover up any discoloration. It offers good coverage and lasts the whole day with little to no touchups. Great for all skin types, this best concealer for fine lines has a lightweight texture that won’t accentuate those “babies.” It also contains SPF 20 for sun protection while still looking pretty. This product claims to be the most comprehensive age-reversing makeup available. It promises flawless, even, brighter, firmer, and smoother skin with its potent and serum-like formula. This moisturizing and creamy formula allows a smooth and even application and is easy to use and rinse off. It comes in a portable and convenient bottle making it ideal for quick retouches. It provides long wear and gives a medium coverage that’s very natural-looking (which makes it great for everyday use.) It doesn’t cause skin breakouts and perfectly hides redness and acne. This product leaves a comfortable feel on the skin and is so lightweight you’ll even forget you have it on. It is also breathable and requires little to no touchups throughout the day. We, however, find it disappointing that it only comes in 4 different shades. This can be a problem since you don’t want to take second guesses about which shade is perfect for you. Smooth and easy to blend, this concealer gives a natural-looking coverage and has SPF. This formula conditions skin and solves 3 common issues like fine lines, puffiness, and dark circles. This product boasts of its triple antioxidant blend which consists of vitamin E, natural soy, and feverfew. These ingredients are also known for their abilities to enhance the skin’s condition. Blendable, this concealer comes in 4 shades and is ideal for those who wear contact lenses. Highly-pigmented, a little goes a long way since a small amount is enough to cover flaws. Superior blending skills aren’t needed with this makeup, making it great even for beginners. It also does not transfer easily and has long staying power even in hot, humid weather. Have you experienced makeup melting off your face in certain conditions? We know we have. What we really love about this product is that it contains SPF. It’s pretty rare for concealers to have sun protection in them and considering its price, we really think it’s a good deal. This liquid under-eye concealer provides moderate coverage and is tested by ophthalmologists. It works by “bridging” wrinkles and fine lines for a firmer and smoother look in an instant. Ideal for all skin types, this oil-free product is infused with ingredients that brighten the skin to even it out and minimize redness. It comes in 6 different shades, all with a luminous finish. Additionally, all shades have a yellow undertone to them perfect for concealing dark circles. This concealer naturally blends in with the skin and won’t cause any breakouts. We love that it doesn’t crease and doesn’t feel greasy which usually happens if you have products layered on. Since this makeup has brightening properties, we won’t apply it on deep areas (aka craters) as it will only emphasize them. Anyhow, it has a lot of product so a little goes a long way. Great for daily use, this product hydrates the skin and won’t dry the skin out. It is great for all skin types and is widely available in stores. Growing old is something we cannot escape from. Sure, it is inevitable, but why should we allow it to show on our face? Here are 8 simple ways you could follow to minimize the appearance of fine lines and wrinkles. Skin tends to get drier as we age, which in turn makes wrinkles more apparent. Moisturizers help in restoring that lost moisture. Moisturizers containing hyaluronic acid are your best bet as it aids in retaining collagen, increasing moisture, and providing flexibility and elasticity. This ingredient helps in fighting wrinkles by increasing collagen production. You can purchase these products through a doctor’s prescription or OTC. Using a lot at a time may lead to skin irritation and may make the signs more obvious. Start off by using one product then gradually introducing a new one in a month or so. When used as a makeup base, primers actually helps soften wrinkles. Make sure to choose something that’s silicone-based to fill in fine lines and uneven skin texture. Using heavy matte formulas can make you look more mature. The solution is to use a sheer yet hydrating formula. If more coverage is needed to hide blemishes or dark spots, apply a layer of concealer under foundation. Wrinkles and fine lines are accentuated when heavy coverage is applied on them. Powder helps makeup stay in place without settling into pores or fine lines. Choose something that is infused with light-reflecting ingredients like mica micro-particles for a more radiant look. You may also want to use a cream blush instead of a powder blush for a more natural finish. It draws attention away as well from lines on the cheeks. This trick is used by makeup artists to shift attention away from facial lines. To do this, opt for matte eyeshadows in neutral colors and stay away from metallic shades that contain shimmer. A sheer gloss, lip stain, and lip pencils are the right ones for this job. Choose a creamy lip liner that’s close to your lip color to line your lips, and then fill it in with lip stain (used in moderation.) Finish it off with a dab of sheer gloss on the center. Fine lines and wrinkles are probably two of the most difficult things to conceal with makeup. Luckily, there are some products specifically designed to combat and address these problems. The Instant Age Rewind Eraser Dark Circles Treatment Concealer by Maybelline obviously wins this roundup. Designed for the under-eye, it fills in fine lines to minimize their appearance. It even comes with a unique applicator to help banish these problems in an instant. This product is also very cheap everyone who has the same problem can buy it in a heartbeat. The best concealer for fine lines and wrinkles has been chosen. You definitely have to check this one out for a more youthful look everywhere you go.